McMahon, now 55, recently graduated from BYU, a requirement for the number retirement and hall of fame induction by completing four courses, which was not easy since he is dealing with early onset dementia following multiple concussions. Source: ESPN College Football. McMahon is a former NFL quarterback. He played for the Chicago Bears, San Diego Chargers, Philadelphia Eagles, Minnesota Vikings, Arizona Cardinals, Cleveland Browns and Green Bay Packers. He played college football at Brigham Young University, where he was a two-time All-American (1980 1981). He was enshrined in the College Football Hall of Fame in 1999. Playing Field Promotions is a booking agent for motivational sports speakers and celebrities. 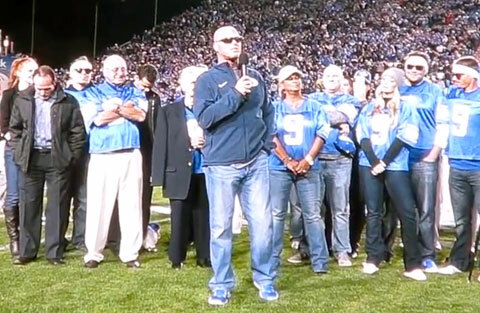 If you would like to book Jim McMahon for a speaking engagement or personal appearance, contact Jim McMahon’s booking agent for appearance & speaker fees at 1.800.966.1380.